I might try the free trial of VMware. That might run it, I've read their opengl is better the virtual box. I honestly don't know why one has to jump through hoops to do so. Seems a disclaimer stating running the same library with both programs could corrupt the library would be enough. I suppose, but I suspect nothing good comes from treating people as if they're incompetent. Anyway, it worked fine on VMware and I was able to accomplish my simple task - export an texture atlas remapped genesis object from the new version. The uv's are messed up on the 4.0.37 version. So I took the atlas remapped object from the new version and imported the uv's into the old version and now texture atlas works for genesis in the old version. Daz or someone might want to make the correctly remapped genesis object available to people using 4.0.37. I'll post the procedure in an appropriate place. somebody could confirm dynamiclothes being usable in 0.9x ver.? ...does it still have issues with shoes, boots, and gloves? Got any specific set you'd like me to test it on? (Warning: I may not have everything, so list couple of popular ones and I give it a go.) Overall, from what I've been testing with Gen 3 and Gen 4 clothes, things seem pretty neat. ...if you have the set, try the Billy Boots from Bad Kitteh's Tool Girl. ...OK kind of late and not about to slog though eight pages so if the questions below are redundant, with earlier comments here, please excuse. 4. What is the current state of the Studio4.5 -> Carrara8Pro Bridge? ...I remember being able to send set ups created in Studio to Carrara 6.1. 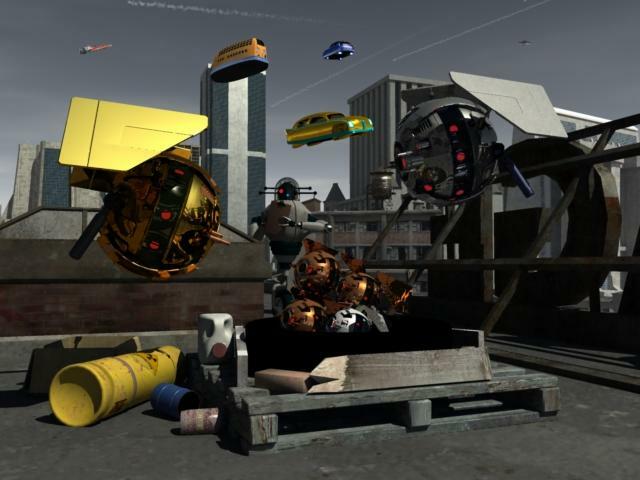 The floater bots and 'baby floaters" in the pic below were set up and posed in Studio2.x before sending the scene to C6.1. I was testing out RC3 with the sample .bvh motion capture data from ipisoft. Had some mesh poke through that I couldn't control even by playing with the smoothing & iterations settings for an hour. So there is still some room for improvement there, but overall it's not too bad. I also rendered with 3Delight's motion blur on the default setting to see what would happen. The default setting turned out to be a little strong. I didn't adjust the aniBlock either because I wanted to show the unadjusted result to someone on another forum. Hmmm. just converted a pair of shoes to Genesis using the V4 fitting technique that was told to me. Works great but of course it's an older set so no DS mats for it (Miss DeeAnna J) so used Shaders instead. I've noticed that the shader tiling, while it works, the preview is not updating to show the new size when tiling up or down. Not sure if this is a bug or not but I tried about 4 shaders that use textures and none are doing real time updates as I move the slider back and forth. Can someone test this out and let me know so I can make a bug report if needed?? If the shader was ubersurface then the preview doesn't update with the tiling. Daz default shader (to my knowledge) is the only one that shows the effect of tiling in the preview. 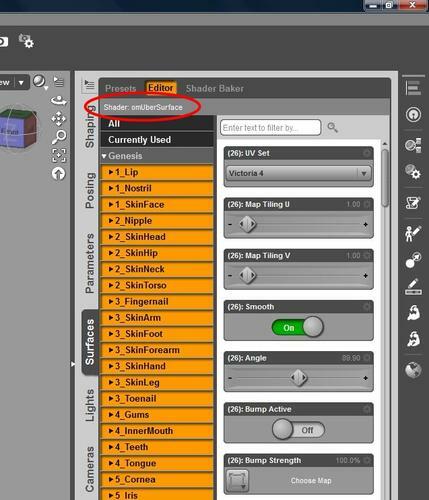 The shader used can be identified at the top of the surfaces tab. Im pretty sure that the supersuit uses Daz Default, Uber surface and Furify shaders if not more. Could anyone tell me what is the best/fastest way to remove unwanted morphs from Transfer/Autofitted clothing. The transferred morphs are dialing in automatically with morphs contained in the actor tab. So for example the genesis Voluptous dial transfers the genesis morph but also increases the V4 voluptous morph on the clothing. its on the way !!! I may have missed this when scanning through the posts. If you currently have DazStudio 4 Pro. Do you need to purchase 4.5 Pro to get it when the final is released? (Its 0.00 right now of course, but I don't want to find the Its released and its an upgrade if you didn't buy the 4.5 Pro while it was free). in the description page it says you can dl the content separately yet there is no dl link as to where you can find the content file dl. Where exactly did you see that? The only page I can find, http://www.daz3d.com/products/daz-studio/daz-studio-what-is-daz-studio, mentions nothing about the content. If you already have DS4 Pro in your order history, just reset it and you'll get all the downloads for both 4.5 and 4.0.3.47, including the content installer. No Bridge is correct. Carrara 8.5 reads the same file format though. Save a DUF file in DAZ Studio (as long as it wasn't created including a .daz in the scene) and it opens in Carrara 8.5. Not entirely there, but close and getting closer. Does anyone have a work around so daz 4.5 doesn't uninstall 4.0.37? I would run it within a virtual machine, but virtual box doesn't support the openGLl it needs - at least last time I checked. Not supported nor recommended. They share profiles and styles which causes all sorts of issues. There are a few other places where things shared causes issues but those are the two most obvious things.